Mystery Moves: What is the Chinese Squid Fleet Doing in the Pacific? 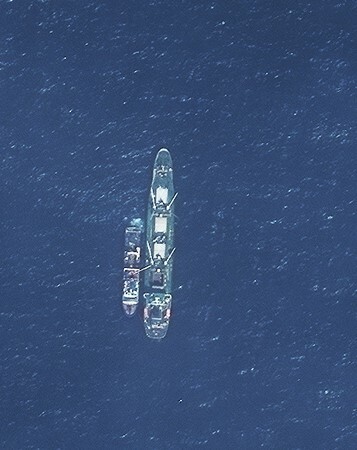 Over the past couple of months, SkyTruth analyst Bjorn Bergman has been watching some interesting activity by the Chinese fishing fleet in the Pacific. A large Chinese flagged squid-fishing fleet had been fishing at the boundary of Peru’s exclusive economic zone (EEZ) throughout the summer and fall of 2016. Then, near the middle of December, many of them suddenly began migrating some 3,000 miles to the northwest. At their new location, around 118 degrees West longitude and just north of the equator, they met up with another group of Chinese-flagged vessels. 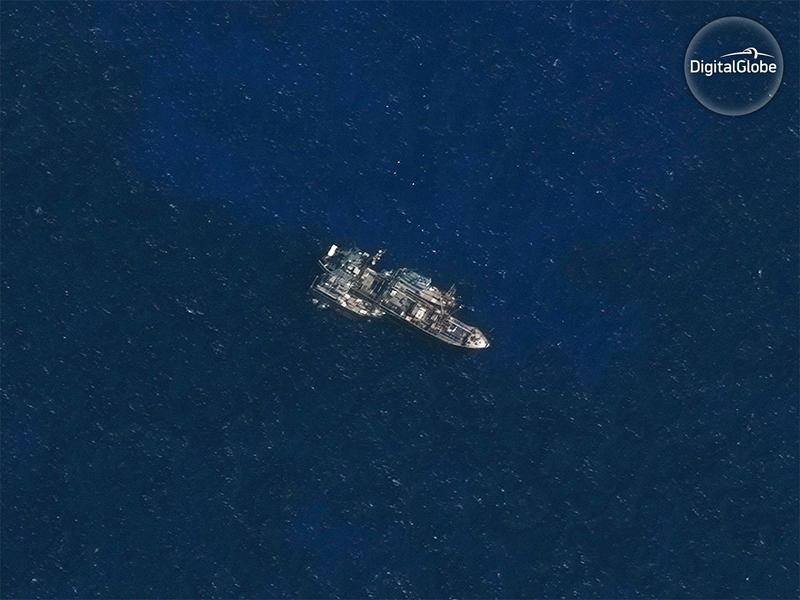 These vessels had just moved to this remote part of the Pacific about a week or two earlier. Some arrived from China and Indonesia, and some came directly from fishing just outside the Japanese EEZ. 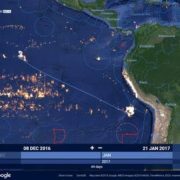 This screen shot from the Global Fishing Watch map shows the movement of 55 Chinese flagged vessels from early November 2016 through February 5, 2017. You can see vessels moving to a single location around 118 degrees West longitude from the western Pacific (red tracks), and from the squid fishing grounds just outside the Peru EEZ (blue tracks). 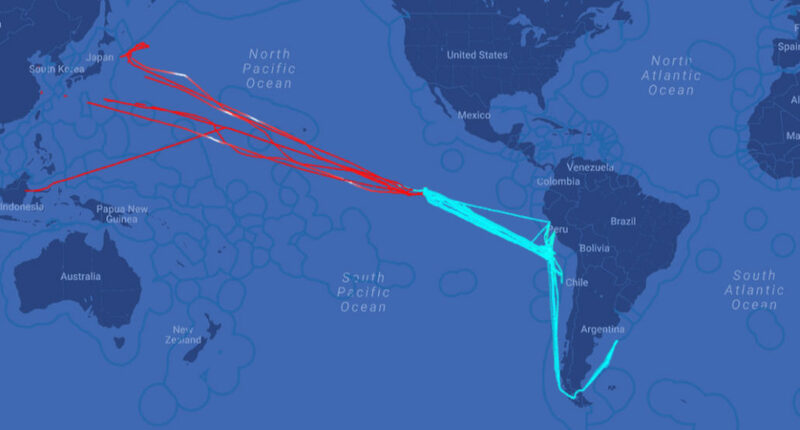 Some vessels off the Peru EEZ also moved south to Argentina. You will find a link to see these tracks on the live map at the bottom of this post. When fishing for squid, fishers use powerful lights to attract the animals to the surface for an easy catch. 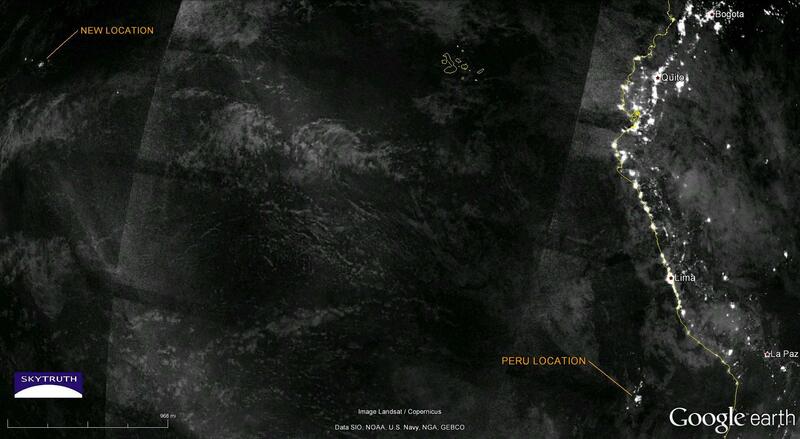 This nighttime VIIRS imagery from the Suomi-NPP satellite, taken on January 29, 2017, shows the lights of Chinese squid fishing vessels off of Peru, and at the new location in the middle of the Pacific. The same pattern is seen using satellite signals from fishing vessels. This Global Fishing Watch heat map shows the AIS signals from fishing vessels from January 9 to February 2, 2017. With one fishing track defined in blue, we can see the path of the Chinese squid fleet moving from just outside the Peru EEZ to a location on the high seas. The new location of these vessels is not known for squid. It is also an unlikely habitat as squid usually live near continental shelves and canyons where there are steep changes in water depth. It’s unclear what the vessels are fishing for now, but the sudden move from the eastern Pacific may be a reflection of a dwindling catch. Usually Chinese flagged squid fishers operating around South America concentrate off of Peru in the Pacific and Argentina in the Atlantic Ocean. For the past few years, some squid-fishing fleets have seen their catch decline in both regions. Undercurrent News reports that some Taiwanese boat captains abandoned squid altogether because of low catch. They are now targeting Pacific saury (mackerel pike), which is found in the north Pacific. Perhaps the Chinese fleet around South America has also given up on catching squid. We noted that when many of the Chinese vessels off Peru began moving to the northwest, some of them turned south, headed for Argentina, but according to Undercurrent, Chinese captains who moved to Argentina said they wish they had stayed in Peru because the catch was so bad. The fleet that stayed in Peru may not have fared much better. 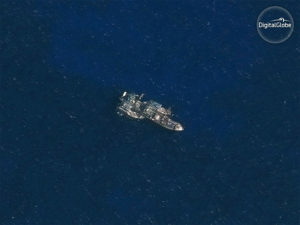 By February 7, only three Chinese squid-fishing vessels remained in that location. Why so many have moved some 3,000 km to the northwest, and what they’re fishing for now remains a mystery to us. Whatever it is, it’s also drawn a crowd of Chinese vessels from the western Pacific. We checked in with the Southern Pacific Regional Management Organization that has jurisdiction over the area, and even they are not sure what the sudden change in location by this fleet means. We would be very interested to hear from anyone who can help explain it. 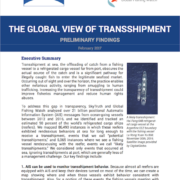 https://skytruth.org/wp-content/uploads/2017/01/Squid-fleet-Movements-2016-GFW-.jpg 333 590 Kimbra Cutlip /wp-content/uploads/2016/08/test_logo.png Kimbra Cutlip2017-02-08 21:13:542018-12-24 15:30:23Mystery Moves: What is the Chinese Squid Fleet Doing in the Pacific?